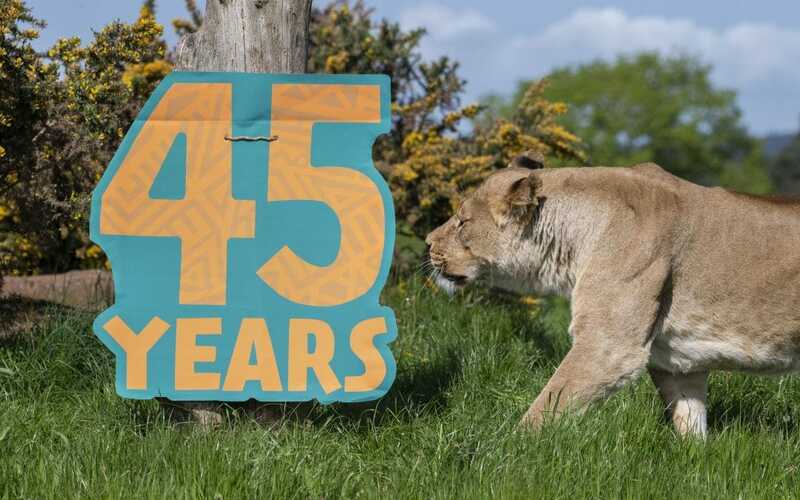 West Midland Safari Park is celebrating its 45th anniversary this year with the help of their pride of African lions, one of the first species to arrive at the Park at its inception. Opened in the spring of 1973 by actress Sophia Loren, what began as a fairly small local attraction located in the heart of Worcestershire has now evolved into one of the largest attractions in the Midlands. As well as the four-mile self-drive safari and animal exhibits, the 200 acre site is now home to the largest dinosaur and ice age experiences in the UK – Land of the Living Dinosaurs and Ice Age – the latter of which opened earlier this year. Both exhibits feature enormous animatronic creatures complete with breathing and roaring sound effects, allowing guests to step back in time and embark on a prehistoric adventure like no other. The fun continues in the Adventure Theme Park, with rides and games available for all of the family. A staple for all good theme parks is the ‘Pirate Ship’, which was the first ride to be opened in 1983, closely followed by the ‘Congo Carousel’. Most recently opened in the area was the thrilling ‘Kong’, which was introduced in 2015. 2018 also marks the 40th year of the Park’s Managing Director, Ivan Knezovich, who began working at the attraction as a Sea Lion Keeper in 1978. West Midland Safari Park is also responsible for two ex-Sea Life Centres in the seaside towns of Rhyl and Weston-super-Mare. Renamed SeaQuarium in 2001, each centre hosts over 30 exhibits, including British rays, turtles and collections of tropical fish. 2017 saw the opening of the attraction’s brand new Safari Academy, which boasts five sustainably-built classrooms specifically for visiting schools and education groups. Interactive, curriculum-linked sessions are delivered to students in hopes of inspiring a future generation of conservationists. Collectively known as Safari Venues, three unique venues are located in the grounds of the Park, including the beautiful Georgian manor, Spring Grove House. Safari Venues host a variety of events, including weddings, corporate functions and themed party evenings. With many strings to their bow, West Midland Safari Park have several projects in the pipeline for the next five years, including plans for a new rail halt that will connect the Park to the mainline rail network. The new station will make the attraction more accessible to guests further afield, cementing the Park as the ultimate destination for a family day out. The Safari Drive-through, animal exhibits, Land of the Living Dinosaurs and Ice Age are included in the standard admission charge of £24.00 for adults, £19.00 for children aged 3-15 and £22.00 for concessions. Children under the age of three years are admitted free of charge. Admission includes a Free Return Ticket. Adventure Theme Park rides are charged extra.